Ramaswami stresses the importance of including three postures daily in our Vinyasa Krama practice, all held for an extended period, Paschimattanasana (posterior forward bend), Sirsasana (headstand) and Sarvangasana (shoulderstand). On the Vinyasa Krama TT course he would recommend spending five to ten minutes in Sarvangasana, the first three minutes or so with the legs relaxed. In the video you can see I use a timer to keep me honest. VK employs sarvangasana as both a preparatory pose for Sirsasana as well as it's counter. 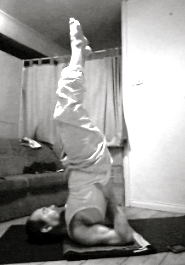 On Ramaswami's advice I save the shoulderstand variations for the one after the headstand. 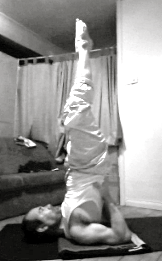 A five minute shoulderstand, the first three minutes of which are done with the legs relaxed. A ten minute headstand. I do the first five minutes focusing on breath and bandhas and then do five minutes of variations. I do this sequence every morning as part of my VK practice. 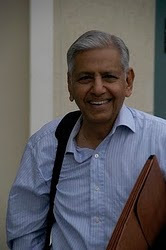 Nice post here from certified Ashtanga teacher David Garrigues recommending the use of a pad under the shoulders and Ramaswami's article on the benefits of inversions here.